The library contains 2.4GB of sample data and 800 loops and phrases. These are split into two Elastik Soundbanks with 400 unique loops in each. One soundbank provides recordings made with suitable amplifier/microphone combinations, ready to instantly drop into your mix. The other contains DI recordings of the same performances, allowing you to add your own amp/cabinet modelling and overdrive/distortion to taste. And, of course, elements from both soundbanks can easily be combined to build your perfect heavy guitar tone. The phrases are organized into two tempos (100 and 130bpm) and two keys (B and F#). Folders within each group contain small collections of riffs that can easily be combined to form song sections. All riffs are 8 bars long and, for each riff, you get three performances. These can be layered/panned to create a tight double/triple tracked sound. A stereo mix of all three phrases, panned left/right/centre is also included for ease of use. As with all the Elastik Instrument Series libraries, the playing and recording quality are of the highest standards. However, the recorded sound is consistent across all groups of loops. With Elastik’s powerful tempo-matching and pitch manipulation tools, including ReTune, it is therefore very simple to mix and match phrases between the different categories or to re-work the phrases to build your own unique performance. 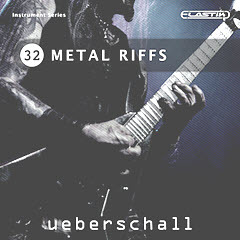 Metal Riffs forms the perfect complement to other metal-based libraries within the Ueberschall catalogue including Shred Guitar, Metal 1 or Metal 2. The moods are mean, aggressive and very, very, heavy and Metal Riffs is ideal for busy producers or media composers looking to add some intense 7 or 8 string guitar action to their next metal flavoured track. The Elastik player can adapt loops to your current song project in speed, scale and pitch. This way all installed Elastik libraries can be combined freely. With functions such as resample, formant and reverse as well as an effective multi mode filter, the samples in Metal Riffs can be easily modified and alienated.